Back in 2008 Kevin Kelly wrote an article suggesting that “an artist only needs 1000 true fans to make a living”. That article generated quite a buzz and was translated to nine other languages. Well, it’s 2015 and I’d like to revisit that piece. In fact I want to apply Kevin’s concept to your social media following and explain you why I think that 100 true Twitter followers is really all you need. He will upvote your articles on community sites, etc. So how many of your Twitter followers are the “true” ones? Let’s look at some real examples. Mari Smith has 345K followers on Twitter and since she’s tweeting a lot of Bit.ly links, we can easily check how much clicks does she get. Just take any of her bit.ly links and add a “+” sybmol at the end. I’ve checked just a few of her links and they got anywhere from 30 to 130 clicks, which means her CTR is around 0,03%. These numbers are of course very rough, but you get the idea. 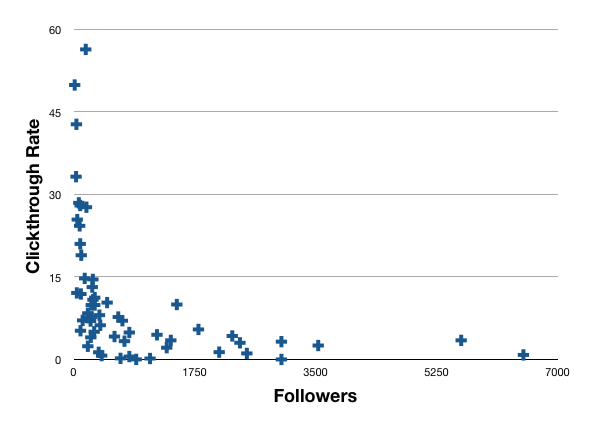 Most people want to grow their Twitter following, because they think this is what brings them traffic from Twitter. I’ve busted this myth a lot of times. Your tweets don’t bring you traffic. Tweets from hundreds of other people do. So why would you need those 100 true followers anyways? Having 100 true followers means that every article on your blog is guaranteed to get 100 tweets. The fact that a hundred people have tweeted your article gives you a ton of credibility points in the eyes of the rest of you visitors. And besides, a person will be more likely to tweet your article when he sees that a hundred other people already did that (this is called Prosocial Behaviour). Any article on their blog will get 1000+ tweets within 10 minutes from being published. That’s because they have a ton of “true followers”, who are automatically tweeting their posts using services like TwitterFeed. So all of your 100 true followers just tweeted your article. How many new visits will this bring you? 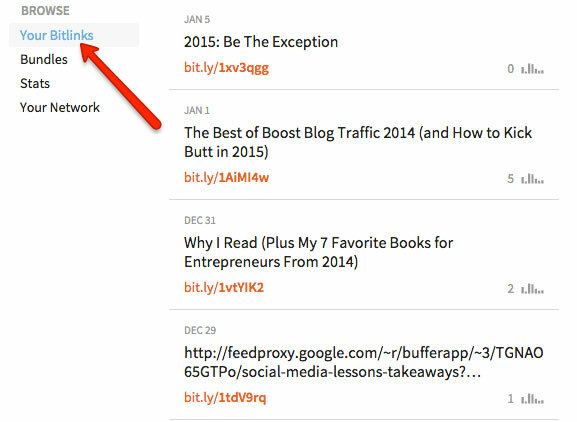 Even if each of their tweets will get a single click – that’s a hundred new visitors to your blog! Meaning that 60% of all clicks to this article came from ordinary people tweeting it. And I believe a fair amount of these “ordinary people” were the “true fans” of Buffer. After submitting my Strategic Writing Guide to Inbound.org I immediately asked my Twitter followers to help me get upvotes. And there was one guy who retweeted my every single help request. His name is Daniel Piñero and the reason he was so supportive is because earlier he reached out to me with a few questions about blogging and I did my best to help him out. That’s when I thought I wish I had more people like Daniel following me on Twitter. All I needed to get to the front page of Inbound.org was 5 votes. And while I was having 2500 followers on Twitter, I didn’t have even 5 “true followers” among them. 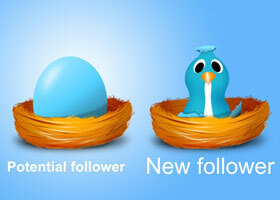 There’s no way of attracting a hundred true followers without gaining a few thousands of lesser followers along the way. Every little thing that you do to gain and maintain the interest of your true followers will help you attract more and more lesser followers. This small circle of diehard fans, which can provide you with a living, is surrounded by concentric circles of Lesser Fans. These folks will not purchase everything you do, and may not seek out direct contact, but they will buy much of what you produce. The processes you develop to feed your True Fans will also nurture Lesser Fans. As you acquire new True Fans, you can also add many more Lesser Fans. If you keep going, you may indeed end up with millions of fans and reach a hit. One hundred “true followers” seems totally doable. Especially when you already have a couple thousands “lesser followers”. Making a person interested in you is fairly easy – I get a dozen genuine followers every time I write a guest article. The hard part is maintaining their interest with time. I guess that’s the answer to the question why Rand Fishkin is so picky about his social sharing. So maybe you should quit focusing on the amount of your followers and start thinking of the ways you can take your relationship with them to the next level? I guess I’m not in a position to talk about ways of turning “lesser followers” into the “true” ones because I don’t have many. But one thing I know for sure is that a personal connection is an absolute requirement. So what do you think about the concept of “100 true followers”? How many “true followers” do you think you have? I'm the guy behind BloggerJet blog. I'm also the guy behind TweetDis and Content Upgrades PRO. But that's like 10% of what I do these days, as the other 90% is devoted to doing marketing for an awesome SEO toolset called Ahrefs. Be the first to know when new post is published. You share perfectly why energy matters more than numbers. You helped, Daniel was loyal for his twitter life lol. Seriously though, if you want a person to be a loyal follower just help ’em in any way possible. Over time this generates a load of karmic brownie points which prospers you mightily, and when you ask for help, they’ll be there for you. I am super active on twitter these days because I have 32 K or 31 K followers or whatever, and I see the potential to make more and more of those folks, friends, so we can all Blog from Paradise together. At least those folks who want to blog from paradise. Listen up folks; Tim has explained wonderfully how to do Twitter, and social media, right. yep! that requires a lot of energy! I guess even “being responsive” is not enough.. oftentimes you have to be the one initiating conversation with each of your “true followers”.. and sending them personal recommendations.. getting to know them better.. I really like this article. It’s a great way to think about all social media – you want engaged followers that will help out. yep.. most people are looking to grow their following to insane numbers when in reality all these people quickly forget about them.. that’s not the way to go! I recently discovered your blog via LinkedIn and I am excited that I did! Your articles are an eye-opener and this one is no different. With so much emphasis on spending time on social media, and the number of your twitter followers as a means for measuring social proof, it is so easy to fall into the trap of getting followers by all means. instead of wasting your time on all known methods of getting new followers…. …we should focus on pleasing a few core followers that already interested in what we have to say..
when we work hard to retain those 100 key followers, we’re going to get tons and tons of lesser followers absolutely naturally! This concept remind me “The Dream 100” of Chet Holmes and it’s applicable to all kind of community. Like the Bacon effect it’s worthy nurturing 100 instead of 1M. Hey Raymundo! Havent’ heard of “The Dream 100″ :) Will go read about it now! Thanks! I agree with you that we need atleast few “true” followers who’ll helped us in every way possible. And you are lucky that you got some. I don’t think I’ve that true followers because I didn’t helped anyone but I’m building that list of true followers by engaging with people on social sites & helping them in need. I don’t use bitly & I think its high time to start using it. once people sign up to your email list, send them an auto-message offering your free help! You have to stop making me feel like I talk about the things that everyone already knows… or I’ll quit blogging!! yeah! you have a point.. the concept is not new and I’ve actually heard it a thousand times..
but I didn’t UNDERSTAND IT! the epiphany came at the moment when I was asking for votes on Twitter.. that’s when I realised that I don’t have any true followers and all these people who follow me don’t really pay attention to what I tweet. Agree with you on this social follower idea. while its fun to have a lot of fans, why have more than you can build a solid relationship? yep.. and in any case..
You can’t get fans with trying to get fans. You can only get fans by DOING stuff that people will love and respect you for. Your blog has always been an inspiration to my marketing journey and i try to read some valuable stuffs on your blog when am less busy. Yesterday I published one article on my blog where I mentioned “1000 true fans” article. This is no doubt one of the best articles which motivates you to concentrate on your loyal readers who are ready to help you anytime. I am twitter since 2010 but I haven’t seen any good traffic coming on my blog from twitter so I stopped using it. But your article is quite convincing to push me to give it a shot again. Loyal readers are the actual earning for any blogger because they respect our work and helps us in viral marketing and mouth publicity for us and our blogs both. You are right, only true followers matter. We don’t need 10000 followers that are not interested in what we are sharing. Thanks for the amazing post. I really like how you backed this up with the data provided. I remember once checking how many fake followers I had, luckily it was in the 1 to 2% range but still that can be a lot of fake bots out there. It’s the real people that really follow your tweets and engage with you that count. I also know people who read mine and chat with me in person about them but never on Twitter (same w/Facebook, I think they are considered lurckers – just lookers who never engage). Thanks for sharing the data with us and have a great day! Hey Lisa! Yeah.. one can have thousands of real followers, but how many of them check his tweets daily? I follow a lot of people on Twitter, but I only check my Twitter feed a few times per week and mostly pay attention to tweets from just a few folks. Hi Tim, I check Twitter daily but I use lists so I don’t see everyone’s tweets. It really helps me to keep focused there otherwise it would be way too time consuming. (Others get lost on FB but my fav is Twitter)…. yep! I use lists too! I was already so focused on trying to get a big Twitter following. Nice topic to be discuss there Tim! A hundred real followers are great than a thousands of fake followers. The true followers means a true lovers of your activities what you do in your twitter account. They making you famous through re tweeting your posts and favorite them all. I agree with you… only true follower does what you ask him to do… but getting those 100 followers seems to be a difficult task… Would love to article on how to gain those 100 true followers.. I completely agree with you that having a few followers are actually follow your tweets and share them are worth much more than having thousands of followers. And here I was trying to get more and more followers just to show off. Thanks for telling us why having 100 true followers is better. Awesome post. It is true all you need are loyalty followers, people who will always support your work instead of many followers who barely even read your posts. Really cool article on importance of real and active followers. All you need is real and active followers not the ghost followers which never engage. Okay. It’s quite logical and I totally agree with this, but… how to gather one hundred followers which are true when you starting new business and has zero followers so far…? Wow! Tim I just found you via Danny Inny from Mirasee. What a fascinating, pleasant voyage it has been and I have learnt so much!! Appreciate greatly that you convey information to us lay-people in such a calm, friendly, laid-back mode and what is more you make one feel so welcome. One thing that intrigues me is that your blog/site here appears so simple and even elegant and then when you poke around there is so much to find. A big thank you! You have a new fan and I’ll be back! Great Blog post buddy. 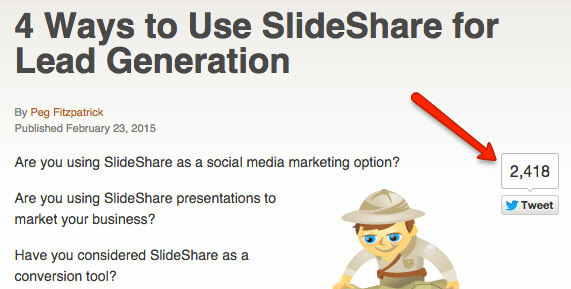 I found out about you from your content upgrades pro WordPress plugin. Still debating if I should get that or Paul Clifford Kudanileads. I will say yours does look really well done. Recently I started a blog myself and am in the beginning stages. I know twitter can help and this article is enlightening. I gotta start engaging my followers more lol. I actually found out about Paul Clifford from Jvzoo. I bought one of his products called Designrr. Kudanileads is about cost the same ballpark as Content Upgrades Pro. It connects with designrr. The only reason I found out about you was I typed in content upgrades and your product came up.